I can't find this one - Thompson's reference is to the drawing (No.11) which the label says is "in the manner of a pastel". Buffenoir, vol. 1(2) p.254-5. Plate 4. Presumed to represent an unlocated original portrait by David. I am not sure whether there are any copies of this lithograph in addition to Buffenoir's reproduction? 33. Anonymous oil-painting originally from the collection of Arsène Houssaye, now in M. Buffenoir's collection; shown at the Galérie Georges Petit in 1893. Buffenoir, plate 8. Not otherwise known? Is this the portrait already listed as No. 22? 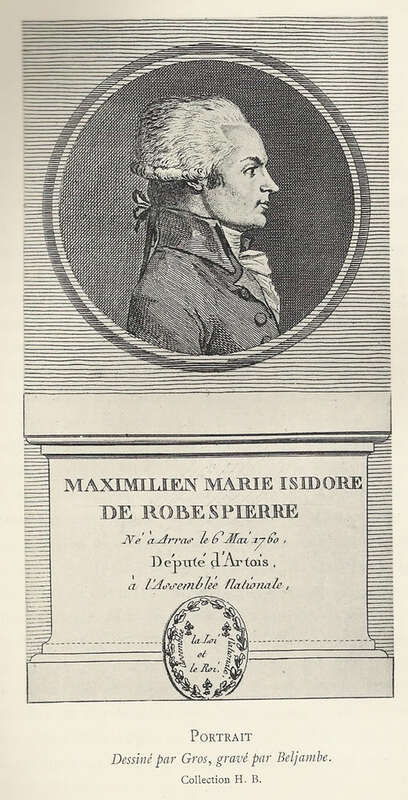 In any case it probably isn't Robespierre? Buffenoir plate 10. Not otherwise known? (1/2 length, sideface, right, head stiffly thrown back, huge stock, collar and jabot.) Almost a caricature. Buffenoir plate 11. Otherwise unknown? Not a very high quality painting. (Head and shoulders, 3/4 face left, hair brushed back, high stock, big jabot and collar, with striped revers, in square frame.) Has the cat-like look.
? I wonder if this is the same painting as No.26 - the picture is illustrated both in Buffenoir's original AR article and in the monograph version. 40. Sketch by Pajou (?) belonging to M. Martin-Schrameck. Buffenoir plate 17. Not otherwise recorded? 41. Sketch by J. Boze (?) left by Albertine Marat to the BN. (1/2 length, 3/4 left).Not much like Robespierre. 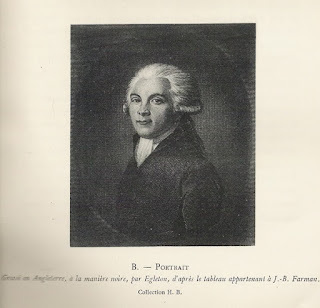 Buffenoir reports that according to M. Armand Dayot the picture was offered to the Cabinet des Estampes by Marat's sister and presumably originally belonged to Marat himself. 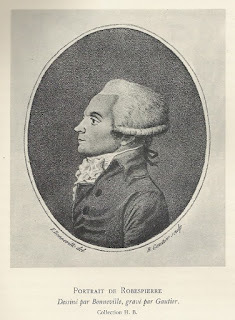 Reproduced in David P. Jordan, Revolutionary career, Plate VII: Jordan comments: "The portrait has a kind of intensity that is lacking in most of the portraits. Partly this is created by having the figure emerge so starkly out of a black background" (p.254). 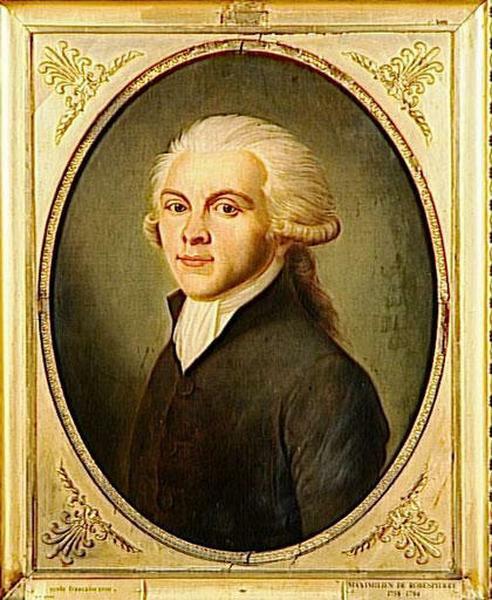 This looks like a pastel - possibly it is one of a series of "deputies" by Boze which included Mirabeau, Danton and Marat. Does it still exist in the BN? I can't find any modern reproductions. (Head and shoulders, side face left) Like No.40, but idealized. Reproduced in Buffenoir, Plate 18bis. 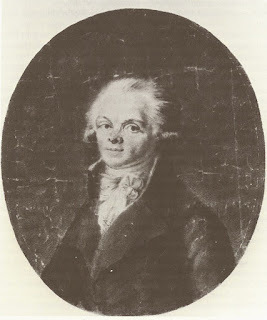 "Portrait aux deux crayons, attributed to Boze"
According to this, the drawing was "formerly ascribed to Antoine-Paul Vincent". The design had the following annotation on the back in the hand of Charles Vatel: "Ce rare et précieux crayon du temps représente d'une manière frappante le portrait au naturel de Maximilien Robespierre"
See: Fernand Beaucamp, "Un portrait inconnu de Robespierre au musée de Lille", Revue du Nord 1928, vol.53, pp.21-34. 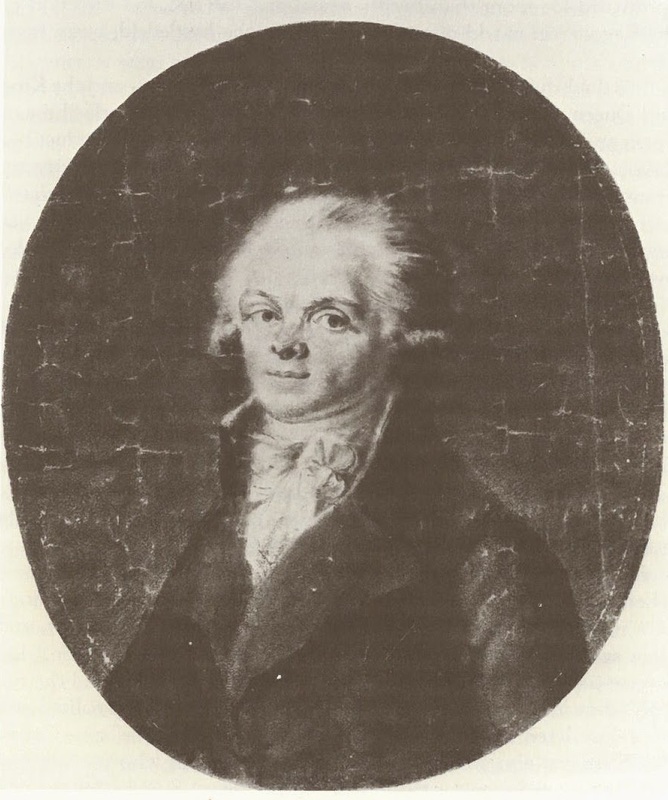 John Laurence Carr, Robespierre p.51 reproduces an engraving which is identical, which he gives as: "Engr. Fouquet (Radio Times Hulton Picture Library"). 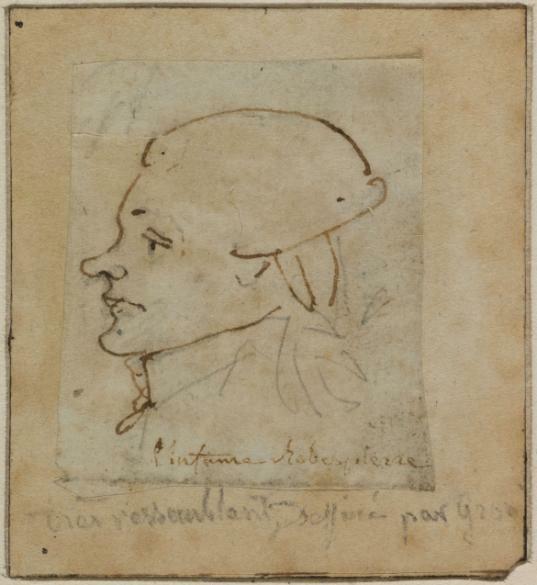 I wonder, therefore, it this might be the original drawing by Jean-Baptiste Fouquet for the physionotrace of Robespierre (No.19). It is certainly very similar. 43. 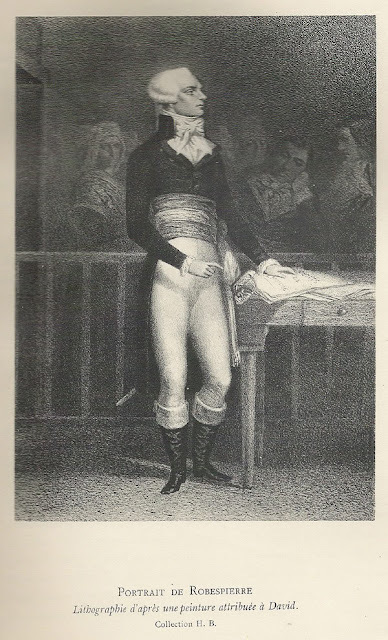 Engraving by Beljambe, from Gros, reproduced by Buffenoir (86) from his collection. (Head and shoulders, side-face right, in oval, above pediment, with inscription La loi et le roi) Previous to August 1792. Buffenoir, vol.1(4), p 648-9. Plate 35. See Jordan, Revolutionary career, plate V, and p.253: "One of the many mass-produced portraits of the deputies, issued in series by various booksellers, inexpensive, and intended for broad distribution. 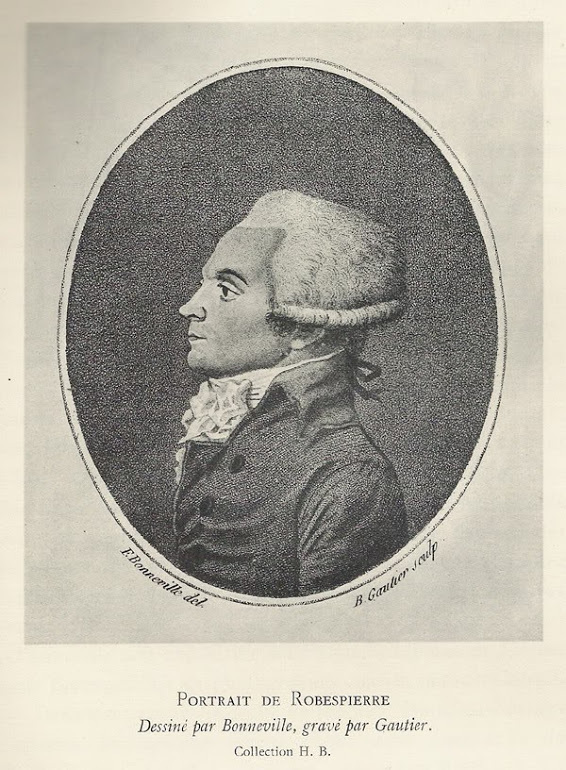 This one is from a volume entitled La collection de Jabin (Jabin was the publisher). 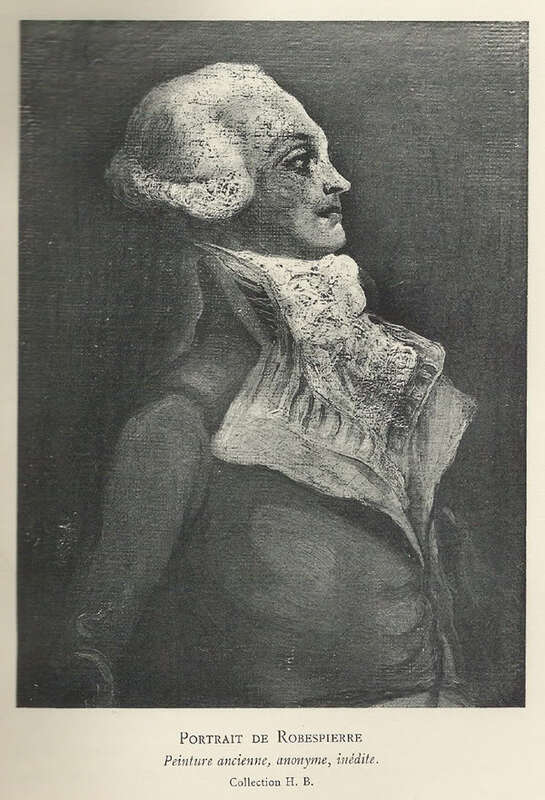 The original drawing as done by Gros, the engraving by Beljambe. The medallion at the bottom of the ornamental plinth, "la Loi et le Roi," represents the cachet of the Constituent Assembly. Robespierre's date of birth is wrong: he was born in 1758 not 1760. Gros's original sketch is in the Bibliothèque Nationale. The wig he is wearing here appears in many portraits"
(Head and shoulders, side-face left) Like No.42 but more lifelike. Buffenoir, AR vol.1(4) p.650-1, Plate 13. 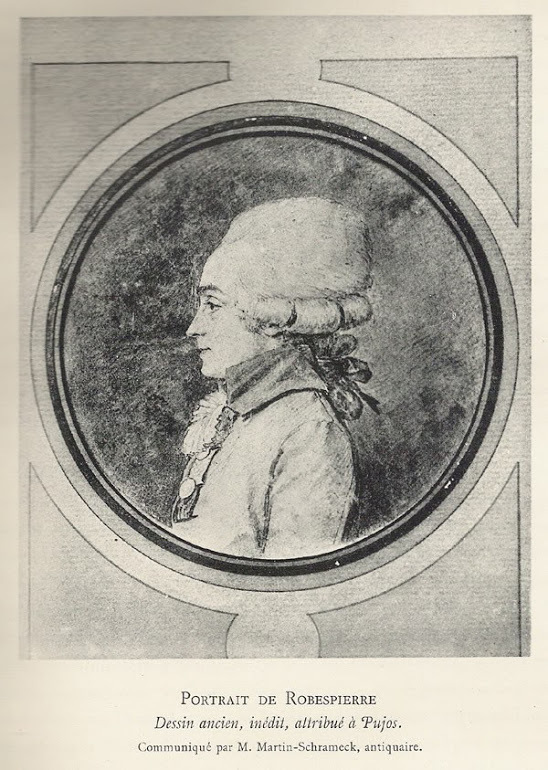 "The portrait by Bonneville, which has become rare, passes with reason as one of the finest of Maximilien, on the same level as Guérin and Fiesinger. 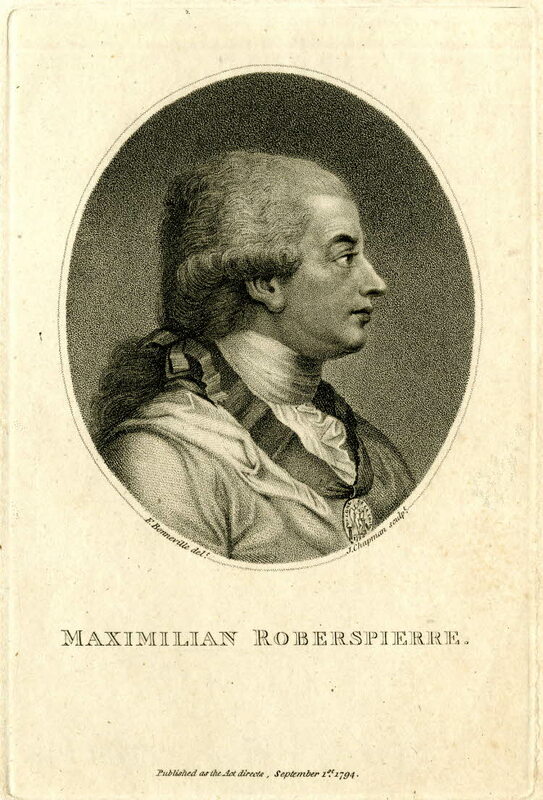 The artist understood the soul of Robespierre.."
Buffenoir also lists an English engraving by Chapman after Bonneville, which Thompson characterises as "very similar". 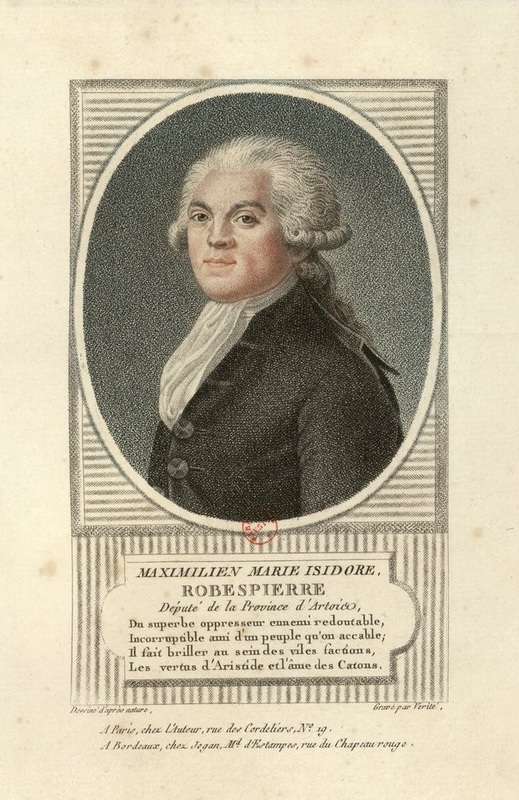 This must be the print, but it isn't the same and it clearly isn't Robespierre! (Head and shoulders, full face, blue coat, white cravat, jabot.) Like no. 8 but not as good. See AR, vol.2(3), p.387-8. Wrong in almost every particular, but not unlike No.27. On Joconde: Oil 46cm x 37cm. Gift of Paul Nadar. 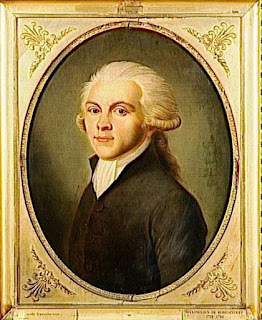 There is no real evidence that this is Robespierre - looks more like Jefferson! Buffenoir, AR, vol.1(2), p.256. Plate 41b. A version in oils - possibly the original painting - was acquired by Versailles in 1909. It is listed as previously belonging to the Vicomte de Cormenin. 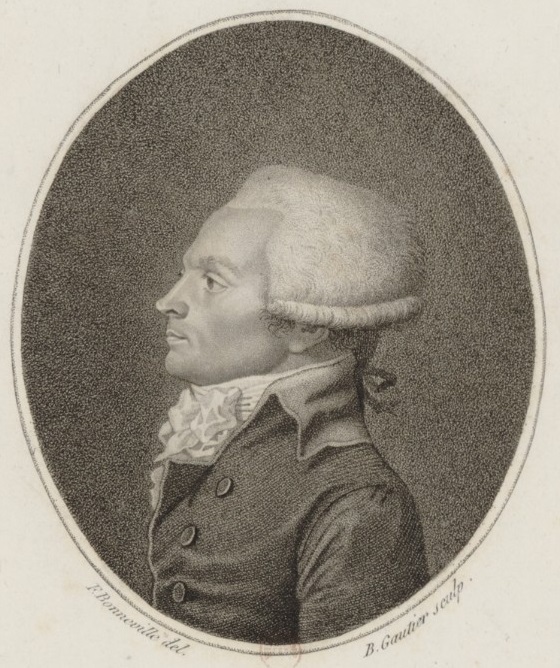 Hervé Leuwers chose this picture for the cover of his 2016 biography of Robespierre. According to Buffenoir, this was a small oval portrait which belonged to Victorien Sardou; sold in 1909. Sadly, it is not to be found. 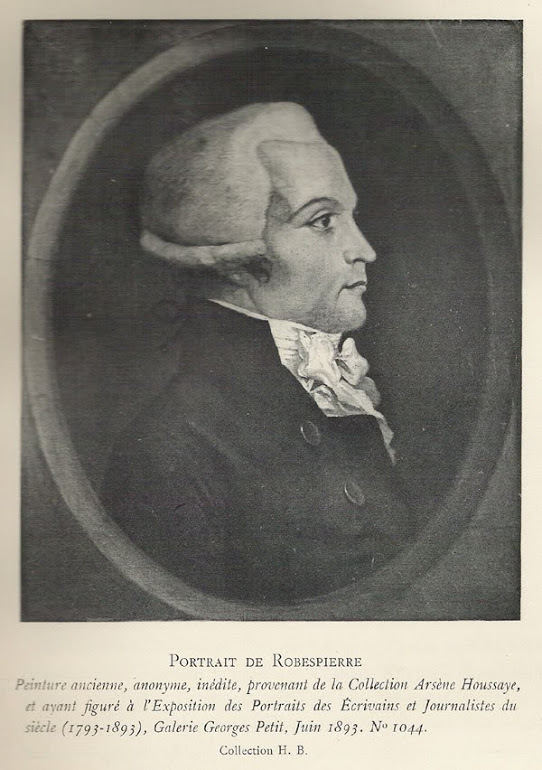 See Gustave Laurent, Annales historiques de la Révolution française 1928, vol. 5(25): p. 63-5. 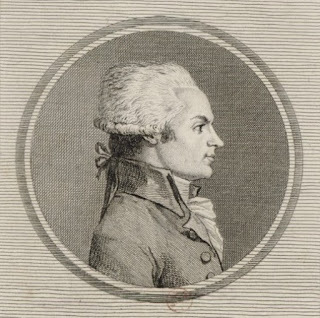 Edme-Bonaventure Courtois (1754-1816), the member of the Convention charged with Robespierre's papers after Thermidor, had a limited edition of prints made by "the engraver Godefroy" after an original portrait in Robespierre's possession which was a "striking ressemblance". 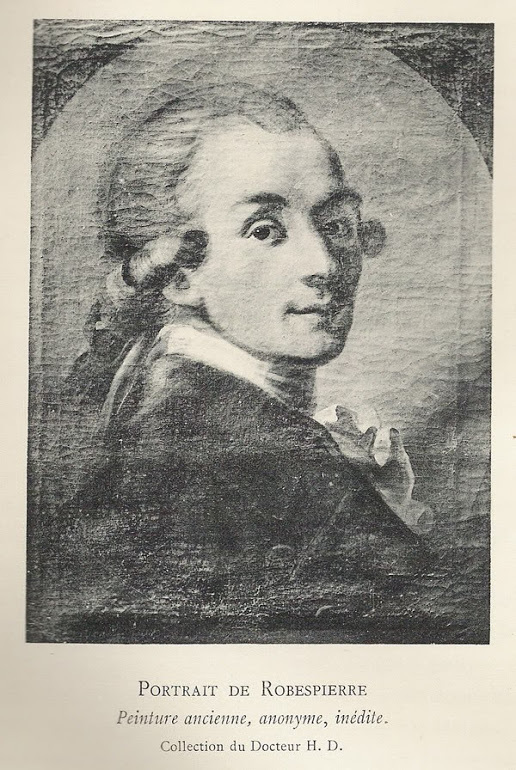 The picture and the engravings are untraced; there is no need to image an engraving by "Geoffrey" since Jean and François Godefroy are well-known portrait engravers of the period. 41. looks to me like a less artistically-competent version of the oil portrait in 47. Dunno - I don't feel 47 is a particularly good picture; the only reproductions of 41 are from the illustration in Buffenoir. I also think you're right about 42 being the 'grand trait' by Fouquet on which 19 is based. It's common for the image to be flipped L to R because of the engraving process, but the detail of the costume is the same, and the meticulous realism (even the slight pockmarks) is suggestive of the physionotrace method. It's also very similar to some other of the Fouquet/Chrétien physionotraces in treatment. Their studio was quite handy for Max's lodgings, too. Further: the pink-tinted paper and dimensions are compatible with their practice for grands traits. The signature has perhaps been lost by trimming: I've seen a signed Fouquet grand trait on line where the signature is behind the sitter's head. 40. also looks to me like a physionotrace, but not of Max. The hair and nose are wrong, and the face seems to me more like a sickly youth (younger than him) of higher social status. The written description of 37 sounds like the portrait given by Clémenceau, which looks to me as if it's been copied from a reversed b/w engraving of the stripey portrait. 36. is now in the Musée des Beaux-Arts in Arras. I saw it the other week. It's very small and a bit better than it looks in Buffenoir's photo, but I think it's probably copied from an engraving and may be 19C (though the gallery has it dated as 1790s).